A pair of Tibetan Buddhist monks work diligently on the sand mandala that will take them two weeks to finish Thursday at St. Joseph's Cultural Center in Grass Valley. The group of monks are already one week into the art piece that is being used to bring awareness of the Tibetan's plight. A group of six visiting Tibetan Buddhist monks have been hard at work placing millions of tiny colored grains of sand to make a mandala at St. Joseph’s Cultural Center in Grass Valley. 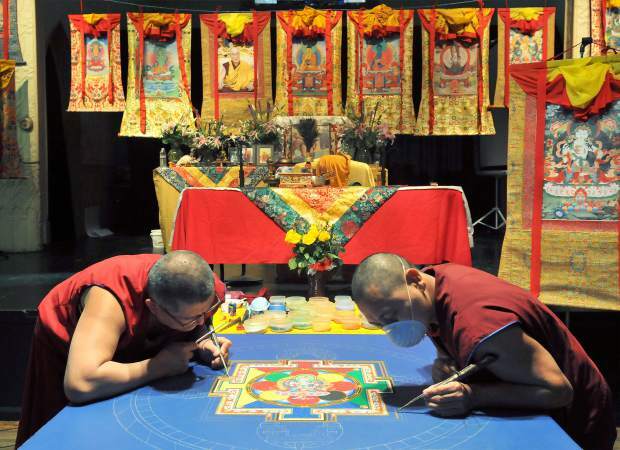 The monks have been working on the mandala for a week and have until Sunday, March 4, to finish the piece, when they plan to drop some sand from the mandala into Deer Creek in Nevada City at 10 a.m. The mandala is being made to raise awareness on the plight of the Tibetan people; the public is encouraged to attend aily viewing sessions of the work in progress. For a full schedule and list of other events, which include animal and land blessings, please see http://www.sierrafriendsoftibet.org. To contact Multimedia Reporter Elias Funez email efunez@theunion or call 530-477-4230.